We will learn a bit about the history of sword fighting, and what movies and TV get wrong about European combat. 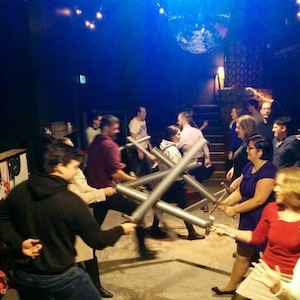 Find out about the differences between longswords, arming swords, rapiers, and greatswords. Learn a couple of techniques and experiment with foam swords. This class will be a mix of theory and practice and afterwards you should be able to strike and parry with a sword and know when a sword fight is good and bad. Gindi Wauchope has been teaching medieval and renaissance combat using a variety of weapons since 2010. He currently teaches rapier, sword & buckler, and longsword combat at the School of Historical Fencing.